I woke up this morning, like I do most mornings, quickly scrolling through Twitter to get an overview of the occurrences of the night before and those I’ve missed earlier in the day. Initially, this morning was like every other — I saw tweets from news personalities, passionate conservative activists, and the usual pundits I follow and engage with on a daily basis. I even saw tweets from Donald Trump as usual, not really giving much thought to them until I came across one of his tweets that had been re-tweeted by one of my close friends.
.@drmoore Russell Moore is truly a terrible representative of Evangelicals and all of the good they stand for. A nasty guy with no heart! Now, I may be one at fault here for not being sensitive enough to the previous tirades of Mr. Trump, and the other people against whom he has spewed similar rhetoric, but this tweet particularly struck me. It’s incredibly sad that a man of such wisdom and stature has been truly misrepresented on a national stage. I don’t intend this to be another “anti-Trump” tirade, as he already receives tolerable media coverage as it is, but rather I want to communicate the vast inaccuracy of this statement and give a small glimpse of the impact that Dr. Moore has on our world. If Dr. Moore is not representative of Evangelicals, I don’t know who is. In six days, I start a nine-month internship with Dr. Moore and other executive leaders from The Ethics and Religious Liberty Commission, the organization of which Dr. Moore is president. For over a year, I have been anxiously awaiting the day that I would have the opportunity to intern with this organization that has had such an incredible impact on my life, equipping me with tools and resources needed to be a voice in sharing the Gospel with my generation and those in my circle of influence. The ERLC is an entity of the Southern Baptist Convention, dedicated to engaging the public square with the Gospel of Jesus Christ. Their vision — kingdom, culture, and mission. Dr. Moore has faithfully led the moral and public policy agency representing the 16 million members of America’s largest Protestant denomination, the SBC, over the past three years. He not only is widely sought after as a cultural commentator, but Dr. Moore is a God-fearing man who, despite his flaws and imperfections, strives to live a life that exhibits the light and love of Jesus Christ in everything he does. Dr. Moore, an ordained Southern Baptist minister, effectively engages our culture without loosing the message of the Gospel — a feat that, in this day in age, is becoming increasingly trying. He is the author of several books including Onward: Engaging the Culture Without Losing the Gospel, blogs on his personal website, and pens articles for some of the largest news publications in the country. This clearly demonstrates the positive influence Dr. Moore has on people across the globe, of all ages and walks of life. When I was in Washington D.C. several weeks ago, I had the opportunity to visit the ERLC’s policy office, and when I walked into Dr. Moore’s personal office, the first things I noticed were the pictures of beautiful wife and five sons. One of the most remarkable attributes of Dr. Moore is not the way he writes or speaks, although I deeply admire and even model my work after his, but the way he leads his own family. As a fierce advocate for families, Dr. Moore speaks to issues about marriage and families, and leads his family in the same way he encourages other men to as well. He serves his wife and examples to his sons the grace and love that God demonstrates to us as His children. “As a loyal Republican, it’s tempting to think that American political parties are ultimate. But they aren’t. The kingdom of God is ultimate and will outlast every political party in the world. Dr. Moore has helped me to see this,” said Closson. Dr. Moore is committed, passionate, faithful, and joyful. He leads, chiefly, knowing where his value is found — in our Father and the blood of Jesus Christ that was shed for him and all of us on the Cross. 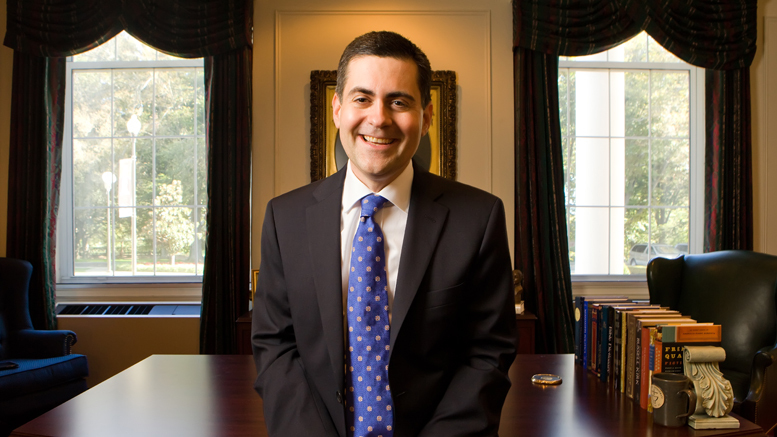 “As a Southern Baptist, it’s encouraging to have Dr. Moore defending not only the values of my denomination, but also the values held by people of faith nationwide,” said Johnson. If anything, Dr. Moore is one of the most qualified to represent Evangelicals on the national stage. “And far from being “a terrible representative of Evangelicals,” Moore is leading the church in the exact direction it needs to go — away from the empty civil religion of the past. In a rapidly changing world, Moore is a voice of strength and encouragement inspiring the church to follow Christ onward to the future,” shares Close. Dr. Moore, thank you for your commitment to the spread of the Gospel. Thank you for continually encouraging my generation to engage our peers in Christ-centered conversations. Thank you for leading your family and for setting an example on how to love, sacrifice, and forgive like Christ. Lauren Rae Konkol is a Florida-grown Southerner who is passionate about people, sweet tea, and cowboy boots. She is crazy in love with Jesus and is the oldest of ten children. She earned her Bachelors in Political Science from The University of Central Florida and is currently pursuing a Masters in Theological Studies from The Southern Baptist Theological Seminary. Lauren lives in Washington, D.C and is on staff with the Ethics and Public Policy Center as well as a part-time research assistant for the Ethics and Religious Liberty Commission. Connect with her on twitter at @laurenkonkol.